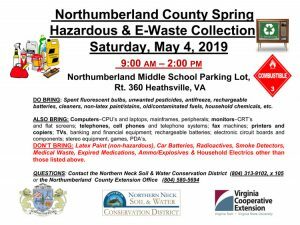 The Northumberland County Spring Hazardous & E-Waste Collection is scheduled for Saturday, May 4, 2019 from 9:00 AM – 2:00 PM at the Northumberland Middle School Parking Lot, Rt. 360 Heathsville, VA.
DO BRING: Spent fluorescent bulbs, unwanted pesticides, antifreeze, rechargeable batteries, cleaners, non-latex paint/stains, old/contaminated fuels, household chemicals, etc. ALSO BRING: Computers–CPU’s and laptops, mainframes, peripherals; monitors–CRT’s and flat screens; telephones, cell phones and telephone systems; fax machines; printers and copiers; TVs, banking and financial equipment; rechargeable batteries; electronic circuit boards and components; stereo equipment, games, PDA’s. DON’T BRING: Latex Paint (non-hazardous), Car Batteries, Radioactives, Smoke Detectors, Medical Waste, Expired Medications, Ammo/Explosives & Household Electrics other than those listed above. 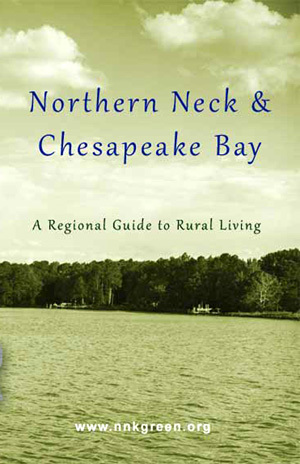 QUESTIONS: Contact the Northern Neck Soil & Water Conservation District (804) 313-9102, x 105 or the Northumberland County Extension Office (804) 580-5694. Click here for full-size pdf flyer.